For many years, doing business as Silver Season, I bought and sold American silverplate, an important industrial product in the late 19th and early 20th century. In the pages listed here, I share some of what I have learned. American Silver Booklets links to free digital booklets available about American silver. International Silver provides background information about the company and its products. 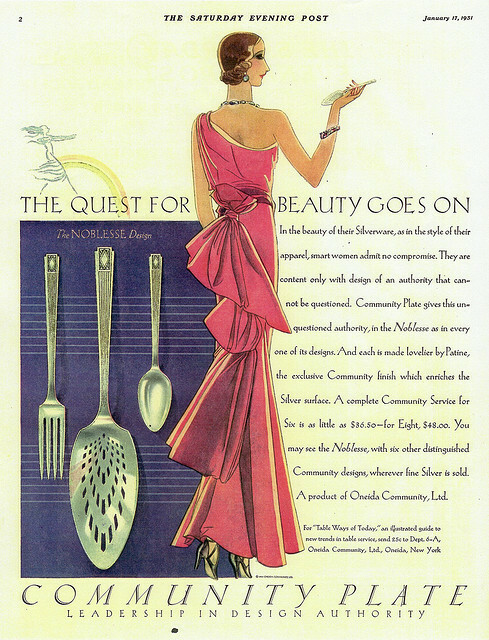 Oneida links you to history and examples from this innovative American silver company. Resources links you to important information resources. Do you, by chance, know the year that the U.S. patent was first issued for silverplating (or electro-depositing?) Obviously, it was after Elkington in the early 1840s, but after that I am lost. You are not the only one who is lost. I will go back and check my reference books, but my recollection is that the U.S. manufacturers who were already making metal cutlery out of Britannia and similar alloys read the Elkington patent and began to experiment with the process. Therefore it is usually said that the Rogers Bros. offered silverplated objects for sale in 1947. They do not say that they invented or patented anything, although they probably made some improvements. I do not know the international patent situation at that time, but if Elkington did not have a patent in the U.S. it would have been extremely difficult for them to enforce their rights here. Oops. That should have been 1847, not 1947. I am collecting Floral by Wallace, do you know how many different pieces were made in this pattern? Do you know if there is a list of the pieces? I have a nice collection but am still surprized with a new piece occasionally. Sorry, I have no special information. It is a beautiful and interesting pattern. I suggest you contact some dealers and also the Replacements Ltd. website. Their inventory lists are often helpful and they have a consumer-advisory service. Great site! I’m doing some research on a partial set of silver-plate I received as we cleaned out my grandmother’s house. I am 99.9% sure it is Wm. Rogers Guild/Cadence pattern (1932). I’m trying to figure out two things — first, during what years this pattern was sold (I’m guessing it was purchased sometime in the late 30’s/early 40’s) and second, what a complete set would have included. This appears to be a set for 8, but I’m not positive, and it’s not in its original case, so I can’t use the space available for guidance. Are their resources you could recommend that would offer this sort of information? Thanks! Some of your questions I have answered by email. The questions of what was a silver “set” often comes up. The silver companies wanted to sell silver so they didn’t like to make the standard set too big. Buyers could always add to the set, and were expected to do so. I am new at this so don’t know where to start. First I am looking for a list (or lists?) of American silver plate patterns. Or, I would like a fully illustrated listing of patterns – on line, in books, and? or….. Which books will be of most use in identifying old (very old) patterns of silver plate – mostly American? Is there an online community sharing information (and enthusiasm) for old silver plate? If so, how do I get in touch? Any help or direction you can give me will be most welcome. There are two books that are very helpful and not expensive: Rainwater’s Encyclopedia of American Silver Manufacturers and Tere Hagan’s Silverplate Flatware. Rainwater shows many marks and Hagan has a useful index of marks and manufacturers. Here is the link to my book list: https://silverseason.wordpress.com/american-silverplate/learning/books-about-silver/. With these two books you can identify most patterns of American silverplate. There are also some good resources on the Internet, but it takes some experience to use them and none are as well organized as the two books. For more, try this link: https://silverseason.wordpress.com/american-silverplate/resources/silver-links/. I sometimes use the Replacements Ltd site to confirm a questionable identification, but you need to know the manufacturer and pattern name.